Santana is a master of covering someone else's song and infusing it with a unique flavor; "She's Not There" is no exception. Written by Rod Argent and released by Argent's band, The Zombies, in 1972, She's Not There has been covered dozens of times by other artists, but none has had the success with it that Carlos Santana did. Dominated by an electric piano (Argent's Hohner Planet), the song includes a barely heard electric guitar track, as well as layered vocal harmonies throughout, in the somewhat dirge-like style favored by many folk bands at the time. The lead vocalist sings much of the song in a somewhat wispy falsetto, which adds to the unique timbre. 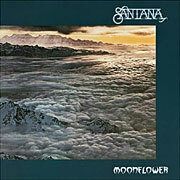 Santana's version, released on 1977's Moonflower, includes quite a few changes to the original arrangement. First is the distinctive riff that opens the song, played by guitar, bass and keyboards -- complete with syncopated accents by the electric piano. When the verse comes in, the rhythm is played mostly by an organ. And the first verse starts with a descending chord pattern on Gm. As with many Santana productions, the guitar appears only sparsely as a rhythm instrument. But Carlos' riffing flows throughout the song, and his guitar melodies form an integral part of the piece. Predictably, his playing stays mostly in the Gm pentatonic scale, with a few notable exceptions that add to the hookiness of his parts. Also added in Santana's version of She's Not There are a series of percussion breaks based around a bluesy riff, and two different guitar solos. The first starts with full-band stops, and the second happens after the percussion breaks. Carlos makes good use of the wah-wah pedal during both solos. Vocally, there is no comparison between the two versions. Santana's singer at the time, Greg Walker, had an incredibly powerful, soulful voice. It's no wonder they left out the harmonies. Walker tears it up, and is the perfect complement to Santana's wailing guitar tone. She's Not There become a hit for Santana, reaching #27, and driving the album, Moonflower, into platinum status -- the last time that would happen until 1999's Supernatural. But she's not there . . .